A borrowed diary, a double life and identity issues fuel a teenager’s quest to find herself before she cracks and commits social suicide. Watch Emi go from dull, suburban babysitter to eclectic urban art star compliments of one crazy summer! 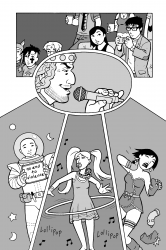 EMIKO SUPERSTAR is a teen drama graphic novel published by DC Comics’ MINX line in 2008. Written by novelist & performance artist Mariko Tamaki and illustrated by Steve Rolston. “Author Tamaki and artist Rolston offer a light but charming fantasy for awkward girls everywhere. 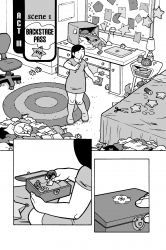 Emiko, a half-Japanese, half-Caucasian Canadian, is a self-described geek facing a summer of babysitting and isolation. Things change when she stumbles upon an underground performing art scene inspired by Andy Warhols Factory. She eventually takes to the stage, dressed in her grandmothers mod outfits from the 60s, and achieves minor celebrity. 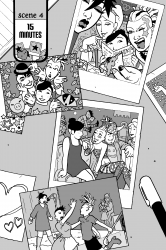 Soon, though, Emiko must face the troubling complexities in the lives of her new friends and the consequences of her own questionable actions. Mariko’s other writings include her first graphic novel, the award-winning SKIM (illustrated by her cousin Jillian Tamaki and published by Groundwood Books). 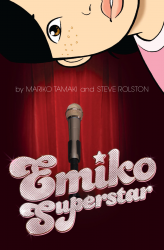 EMIKO SUPERSTAR is her second graphic novel.